No matter how much wool is on my needles, it doesn't quite feel like fall until the leaves begin to change. Tabetha is the designer behind the Esmeralda Shawl, this week's free pattern featured in the Web-Letter, as well as multiple designs in our Spring and Fall collections. 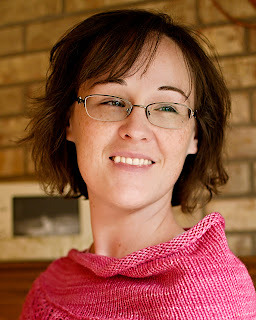 Learn more about Tabetha on her website and blog, and be sure to check out her other designs on Ravelry. Read on to learn about her creative process, how she got started, and to hear her advice for aspiring knit designers! Visit the CEY website to sign up for the weekly Web-Letter, delivering free patterns, news and more to your email inbox every Tuesday. I think I started designing in early 2010, so a little over 2 years now. How did you get started? It all began with an evil plot inside of Jill Wright’s mind… haha! Well, maybe not quite. I had been knitting for about 5 or 6 years and playfully tweaking and jotting notes to design patterns for personal use, so the leap wasn't that big. One cold, rainy day, as I was sitting inside McDonald’s, knitting happily away while my kids played on the playground, this lovely English lady, Jill (an amazing knitwear designer), plopped herself down at my table to pepper me with questions about my knitting and background. Now, anyone who knows Jill would be quite shocked that she came up to someone so boldly, but you can’t deny which way fate tells you to go. 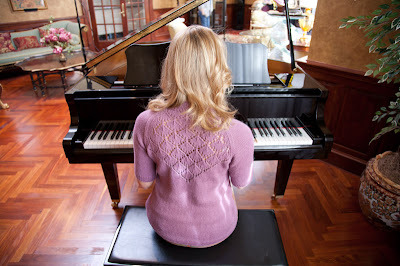 Anyways, she asked if I ever thought about designing, to which I replied, “Design what?” Jill – “knitting patterns for magazines like Vogue or Interweave.” Me – “You can DO THAT? !” Who knew that magazines and yarn companies work with little ol’ gals like me?! Jill and I clicked right away. She handed me her card, told me I should email her sometime, and I promptly went home to do exactly that. I was eager and ready to unleash my creativity in a new outlet. Jill unwittingly became my mentor and greatest cheerleader as I put together my first proposal. Shortly thereafter, she pointed me in the direction of an online knitwear design class taught by Mary Beth Temple, who taught me so much (and also unwittingly became my other mentor in the field). The rest is still being written in the history books. Probably the first thing I ever designed was my Anu Socks, but my first design that was accepted for “outside” publication was the Leaf Trim V-Neck for Creative Knitting Magazine. In this field, it has to be pretty quick! Once I receive the yarn for a project, I swatch (block, dry, and carefully measure the gauge! ), and then immediately calculate and flesh out the main body of the pattern. Knitting begins right away and I can typically finish an intermediate sweater sample in about two weeks. 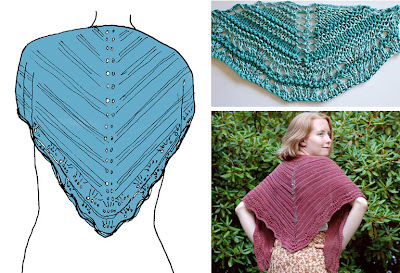 Smaller projects, such as socks or cowls, can be done in about 4-5 days. I imagine I might even be a bit faster, but as a stay-at-home mom to two amazing (and energetic) daughters, as well as managing a household and all the duties THAT entails, I can usually only knit about 2-3 hours a day before I collapse in to bed. Currently, I am in the 18-20 range a year, though I fully expect that to increase by the end of this year. Do you use test knitters? Yes and no. When it comes to independently published designs, I do, but in the magazine/yarn company field, often there isn’t enough time. 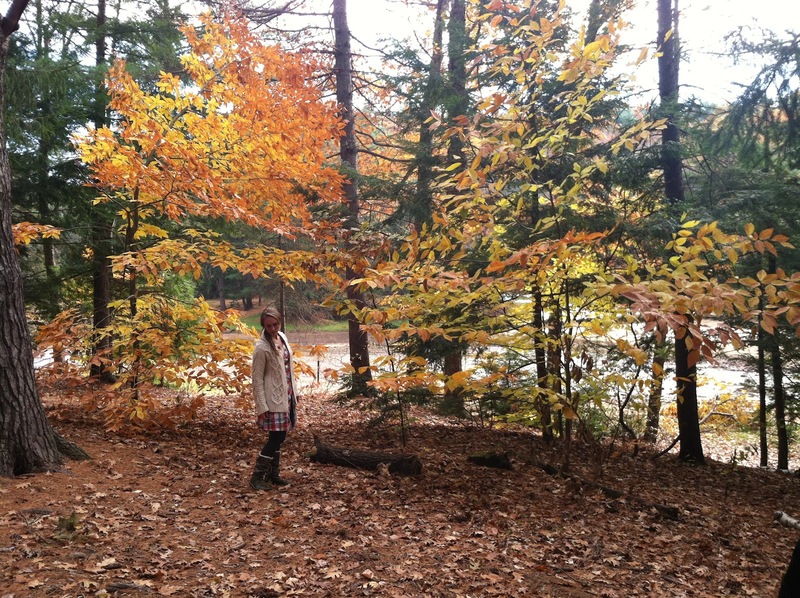 My design process typically follows this path: First - inspiration from just about anywhere – silhouettes, fashion runway shows, stitch patterns, yarn, nature, woodwork. I never can quite anticipate when the muse decides to hit. Next, I throw those ideas on to paper. I sketch and sketch and sketch…. And that method alone often leads to more new design ideas. Sometimes, my sketches don’t go anywhere, but when I am ready to pursue a particular concept, I swatch with different yarns or stitch patterns to see what works best. Lastly, I dive head first into putting the entire concept together. Our home is quite small, so my “office” is located on the dining room table with notepads, sketch pads, and pens shoved into nearby shelves. My yarn, swatches, and knitting tools take up various places throughout the house (to the woe of my husband). Needless to say, I am insanely jealous of designers with their own space, craft studios, and offices. 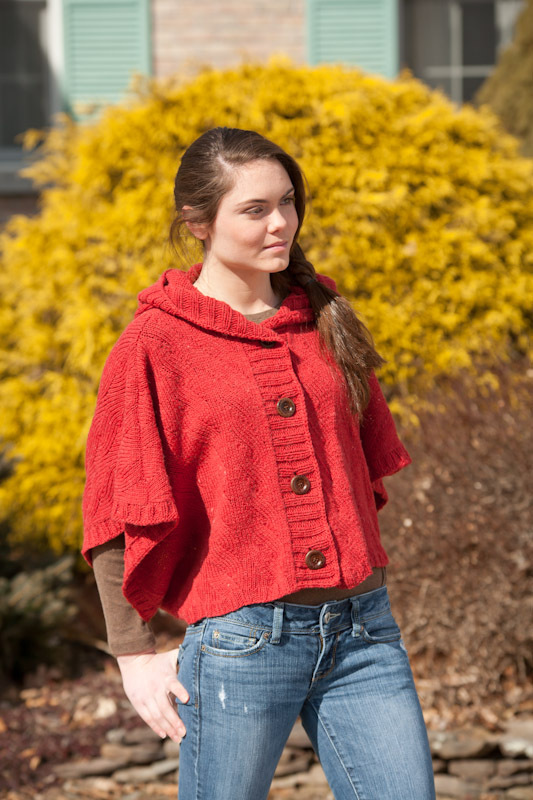 What is your favorite piece you designed for the Fall CEY collection? What was your inspiration? I think my most favorite is the newest design in the Fall Collection – Heiress. I kept seeing these beautiful embroidered tops on the runway and thought it would translate well to lace, and it did! The raglan sleeve caps just pair so nicely with the diamond lace, while the ribbed collar and cuffs give just enough contrast without being too stark. I think the fit is just beautiful. First and foremost, have a support system and keep your chin up. This is a hard, hard market to break in to, but as long as you carry yourself professionally, take constructive feedback well, and ignore the haters, you’ll be on the right road. Andi Clark's Comet sweater is the perfect transitional piece. 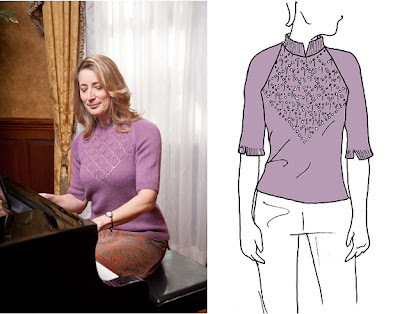 Knit in Soft Linen, it features lace panels on the bodice, a cute seed stitch and lace collar, and kicky pleats flowing from an empire waist. The yarn is transitional too, combining wool, linen and baby alpaca in almost equal proportions in what Clara Parkes called "a perfect example of a smart fiber blend.". The pleats are cleverly constructed, and when my coworker Cheryl suggested we do a blog post about it after puzzling through the instructions on her own, I thought it was a great idea! Supplies: 2 DPN's, US 6, and your knitting (obviously). 1. Knit to within four stitches of your reverse stockinette section. 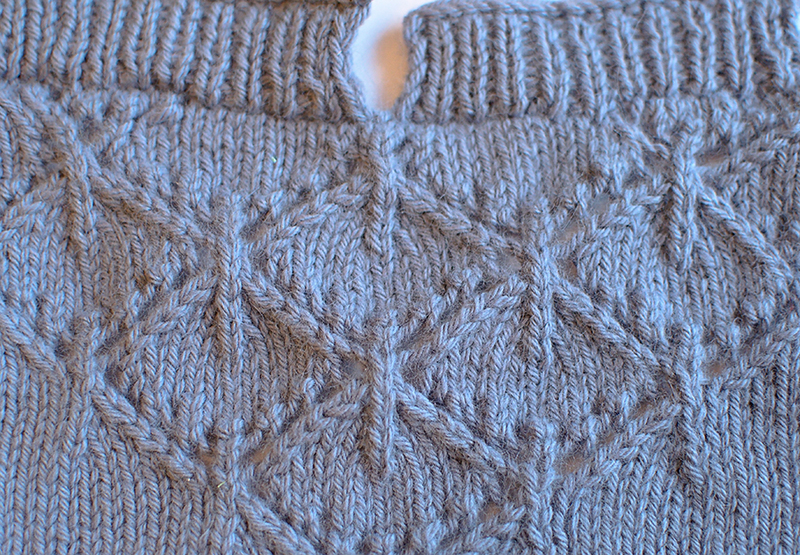 Slip these four knit stitches to one DPN and hold in the front. Slip the next four purl stitches to the other DPN and rotate the needle clockwise. 2. 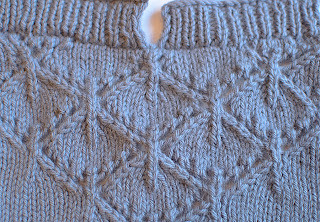 Hold all the needles together and knit 3 together, one stitch from each needle, 4 times. 3. 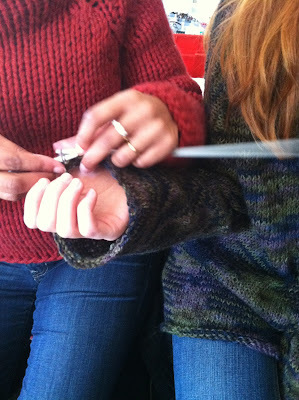 To make your left pleat, slip the next four stitches to a DPN and hold in the back. Slip the next 4 purl stitches to a second DPN. Rotate it counterclockwise so that the RS is facing the stitches on the first DPN. Knit 3 together, one stitch from each needle, 4 times. Voila! It's almost like you're folding it in on itself and "sewing" it together. Happy knitting!